Chewing gum has been around for thousands of years, dating back to ancient time. Most of us have been indulging in chewing gum since we were kids, as it is a sugary treat that we associate with candy. Have you ever stopped to think about how chewing gum affects your dental health? You may be surprised to learn that chewing gum is actually beneficial to your overall oral health. However, you will only reap the benefits if you chew sugar-free gum. Regular chewing gum made with sugar can cause cavities, tooth decay and may even loosen or pull out tooth fillings. According to the American Dental Association, chewing sugar-free gum has proven to help protect teeth. If you cannot brush and floss after a meal, popping a stick of sugar-free gum in your mouth is the next best thing. The act of chewing increases the flow of saliva, helping to wash away food particles that lead to the development of plaque and tartar. Clinical studies have shown that chewing sugarless gum for 20 minutes after a meal can help to prevent tooth decay. 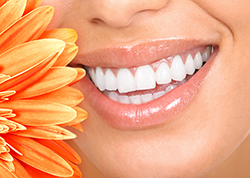 Keeping teeth strong is essential in preserving your natural smile. Over time, tooth enamel begins to weaken or demineralize (dissolving of the surface enamel) due to regular exposure to acids found in foods, sugary drinks and candy. Luckily, there are plenty of sugar-free gums available containing a sweetening agent called Xylitol that has been shown to remineralize (process of returning minerals to the tooth enamel) the tooth’s surface and helps to reduce cavities and plaque. Dry mouth is the feeling of not having enough saliva in your mouth. Everyone experiences dry mouth once in a while due to stress and dehydration. It can cause bad breath, dryness of the throat and may cause soreness of the mouth. A quick fix to treat dry mouth is to chew on a piece of sugarless gum. It helps to moisten your mouth to relieve discomfort and at the same time adds freshness to your breath. However, if symptoms of dry mouth begin to worsen, it is recommended you visit your dentist to be treated properly. Although there are many benefits to chewing sugarless gum, it is not an alternative to regular brushing and flossing. Maintaining proper oral health at home and regular dental check ups are the most effective ways to prevent tooth decay and help to keep your natural teeth. If you are unsure of which sugar-free gum is right for you, look for the American Dental Association seal (ADA) on the package. These products have been tested and proven with scientific evidence that sugar-free chewing gum is effective in reducing plaque, cavities, and promoting remineralization of tooth enamel. To see which sugar-free brands made it on their list, visit the American Dental Association’s website. Contact Us today to schedule an appointment to discuss your questions about tooth brushing and oral hygiene. Bad breath (halitosis) is a common problem, which often comes from the activity of bacteria in the mouth. Although there is no way of knowing for sure, most adults probably suffer from bad breath occasionally, with perhaps a quarter suffering from it on a regular basis. There are two types of bad breath. Transitory, or occasional, bad breath is caused by foods like garlic and onions and generally only lasts from 24 to 72 hours. It might be referred to as "morning breath," which goes away after you brush your teeth. Chronic, or regular, bad breath does not improve over time. In some instances, chronic bad breath is actually caused by underlying medical conditions like diabetes, sinusitis or emphysema. And in those rare situations, treating the disease could possibly eliminate the cause of the bad breath. The odor of chronic bad breath results when bacteria in the mouth and on the tongue cause the formation of volatile sulfur compounds (VSC's) in the form of hydrogen sulfides. The back of the tongue is the prime breeding spot for anaerobic bacteria that creates odor-causing Volatile Sulfur Compounds. This may be an ongoing problem requiring professional breath management. Talk to your Dr. Katie about bad breath. She may have a treatment that fights both the cause and effect of bad breath! Every month you pay for dental insurance. If it comes out of your paycheck, you might not even notice...but you do pay for it. • We can't tell you exactly how much your insurance will pay (but because we see so many patients we can give you a pretty good estimate). • We can't be sure how much of your benefit is left (but we can help you plan your dental work to minimize your costs). • We can't tell you why your insurance company makes the decisions it does (but we can provide you with all the information you need to find out). • We can’t be responsible for your insurance claim (but we can bill your insurance as a service to you). 1.Talk to your insurance company. Before you come in, give your insurance company a call. Ask them how much benefit you have left, if there are any waiting periods, and how much your plan pays for preventative, basic, and major work. 2.Talk to us. We can schedule treatment to help you avoid going over your benefit. We can help you get a pre-determination letter showing what your insurance pays for treatment options. We can explain the costs and benefits of those options. 3.Ask questions. If something doesn't make sense to you, ask. You are the boss and are entitled to clear answers. A dental filling is arguably the most well known dental procedure. But what exactly does it do? The human body has the incredible ability to restore itself after injury or illness. White blood cells gather at a scratch or cut on the skin almost immediately to start the healing process. Broken bones will eventually fuse back together. Even after parts of the brain are damaged, other parts can take over the lost functions. However, our teeth cannot repair themselves. A cavity - a hole in the surface of a tooth caused by bacteria build-up - will require a filling from your Cedar Rapids dentist to seal it closed. There are two types of filling compound - amalgam and composite. Which one you get depends largely on where in your mouth the cavity is located. For back teeth, amalgam is strongly recommended. Made of a mixture of metals, it is more durable than composite and can better withstand the pressure from chewing. Composite is a resin material that is "tooth-colored" and more often used on the surfaces of visible teeth. After administering local anesthetic that numbs the specific area in your mouth, the tooth will be "prepared" - a process in which Dr Milden uses a handheld tool to carve out the decay and any extra space around the cavity needed to place the filling material. This seals off your tooth, keeping any further bacteria from entering the inner portions and causing further infection. Once the material has hardened, Dr. Milden will check to see if the filling needs any further shaping to mold it perfectly against your tooth. It is a fairly quick process, depending on the number and severity of your cavities, and you can return to normal activities as soon as the numbing medications wear off. Fillings are a low-cost way of maintaining your smile and avoiding more in-depth and costly procedures like root canals or extractions. The dental professionals at Dr. Katie Milden's office in Cedar Rapids would be happy to answer any questions you have about dental fillings.